I have been totally absent these past few days, no posting, minor Facebook chatter and zero Pinterest, a much-needed break for me. Since my boyfriend spent the last week in Europe, I have been super short on sleep, maybe 4-5 hours a night. Then this past Wednesday I took off for Colorado for a snowsports tradeshow in Denver for work. I arrive very late Wednesday night and spent all day Thursday at the show. My boyfriend arrived in Denver Thursday evening and I was so excited to see him! Beginning Wednesday night, a major storm system had moved into the Colorado Mountains and by Friday morning, nearly 3 feet of snow had fallen. We got up in the wee hours of the morning on Friday to take of for Breckenridge with my brother. Friday was pretty insane. It took us hours to get up the hill, but it was totally worth it. Waist deep powder lines left me exhausted and run down from no sleep. Day like that (with 3 feet of fresh snow) just don’t come around often. Friday night, we slept for 14 hours! We awoke Saturday morning and all the travel and exhaustion finally caught up with my boyfriend. He was bed ridden all day with a nasty cold. I was so bummed to leave him in bed, but the sun was finally out and plenty of fresh snow was left for the taking. 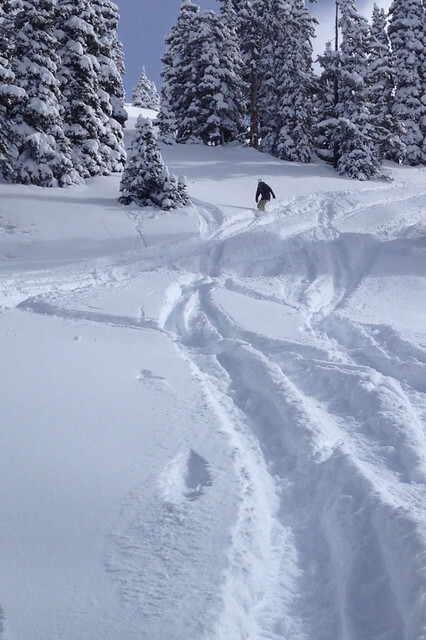 I met with a friend from home and we took more powder laps at Keystone. 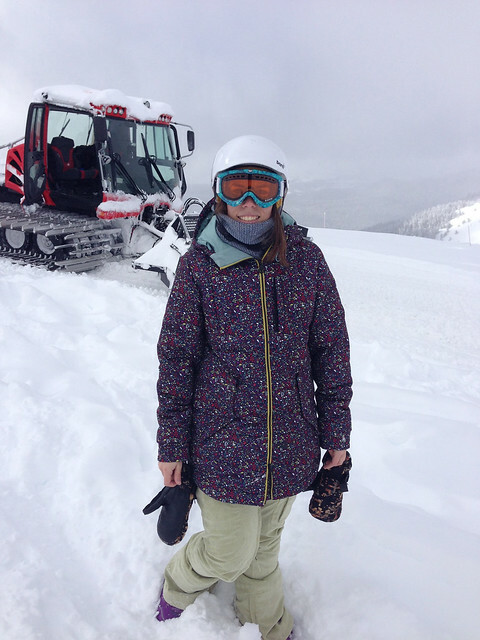 It was an amazing day, we even took a snowcat ridge out to some open bowls and got some amazing runs in. I had never done anything like this before! I think I will write more about that later but here are a few photos; It was amazing! I am bummed to be heading home today but I have a big week ahead of my. I am home for two days and then taking off for Utah- More about that later! First, let’s talk sweets. 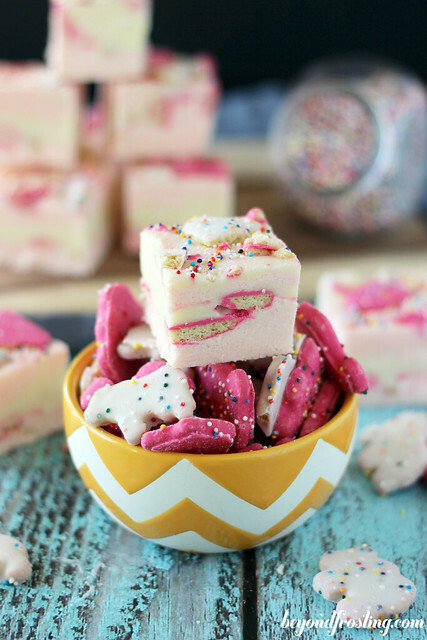 I am not going to come out and say that Circus Animal Fudge is a Valentine’s Day recipe, because those dang cookies are good 365 days a year. 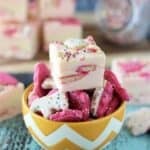 However, the added addition of the strawberry pudding mix to this fudge not only gives it a light tint of pink color, but strawberries are totally Valentine’s appropriate. 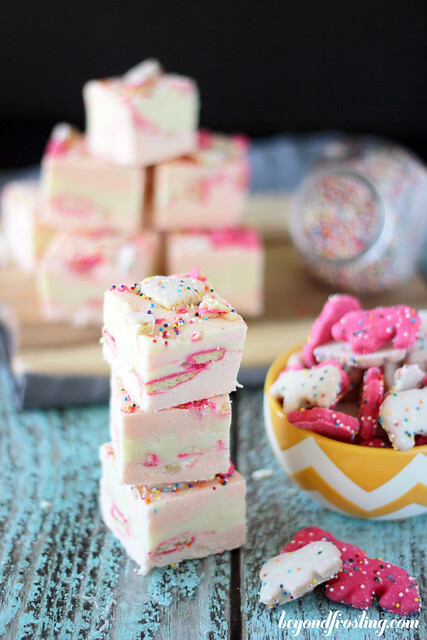 I swirled together a strawberry and white chocolate fudge to make this recipe! Remember I told you last week how I hit up Walmart at 9pm on a Friday? While I was hanging out in the baking section I spotted a box of instant strawberries and cream pudding mix. At the time, I hadn’t had a plan for it, but as I thought about this fudge more and more, it because clear to me that I wanted to use it for a fudge. Now for me, this fudge was actually a little TOO sweet from the strawberry pudding mix, but it got rave reviews at my office. If you are unable to find the strawberry pudding mix, I would just omit it from the recipe and make it a white chocolate fudge! If you are going to do this, you can cook all the ingredients together (white chocolate, butter and milk) and just add the marshmallow at the end. 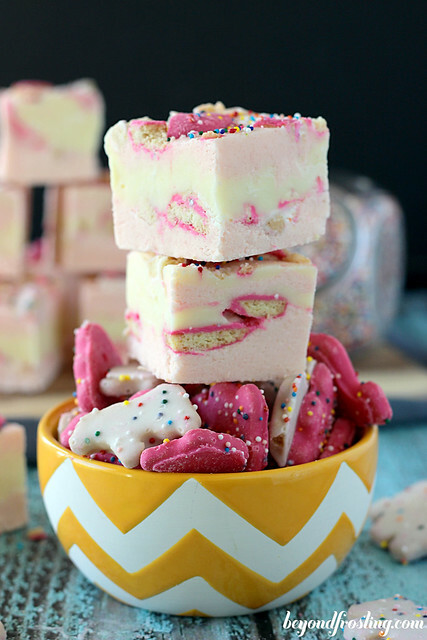 I think the circus animal cookies are a perfect addition to this fudge. Make sure you crush plenty of them for the middle layer and then drop a few pieces on top for looks! Whenever I make fudge, I always coat the pan with Crisco and then line it with parchment paper. This helps the fudge release from the pan once it has set. I also allow it to sit out for at least 30 minutes before cutting. Use a sharp or serrated knife to cut the fudge. Enjoy! Grease a 9×9 glass pan with Crisco and/or line with parchment paper (I do both- it makes it easier to remove the fudge once it is set). Set pan aside. 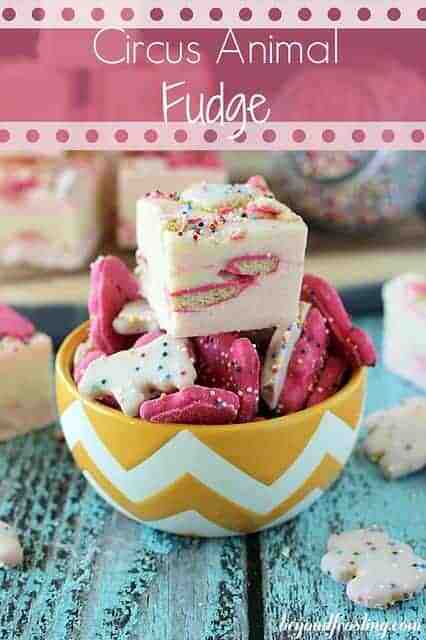 To prepare the strawberry fudge, combine white chocolate chips, butter and sweetened condensed milk in a pot. Heat on medium low heat and stir until completely mixed. White chocolate can burn easily, so watch carefully. Once fully melted, add marshmallow cream and instant strawberry fudge and whisk until smooth. Pour 2/3 of mix into bottom of glass pan. Set remaining 1/3 aside. Press 2/3 of the circus animal crackers into the strawberry fudge base. Prepare the white chocolate fudge by combining the white chocolate chips, butter and sweetened condensed milk in a pot. Heat on medium low heat and stir until completely mixed. White chocolate can burn easily, so watch carefully. Pour mixture over top of strawberry fudge. Poor remaining 1/3 of strawberry fudge on top and swirl with a knife. 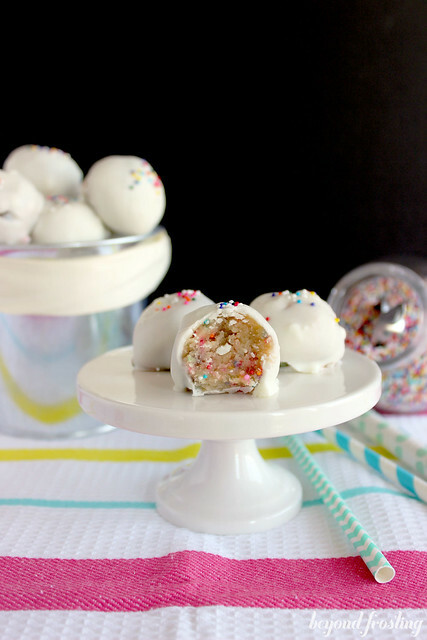 Press remaining circus animal crackers into the top of the fudge and add additional sprinkles. 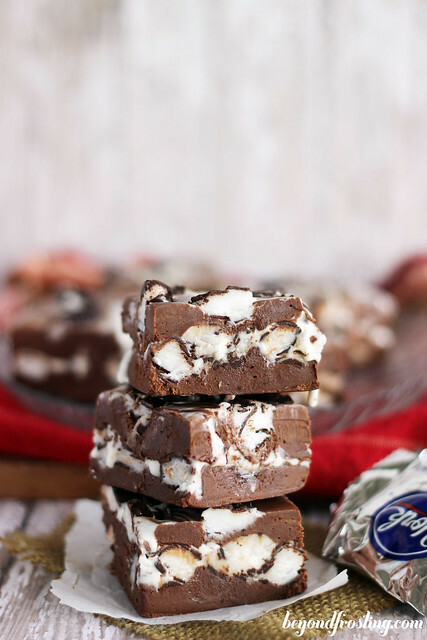 Allow fudge to set in the refrigerator for at least 4 hours. Remove from refrigerator 30 minutes before cutting to allow chocolate to soften slightly. I suggest removing fudge from pan before cutting.